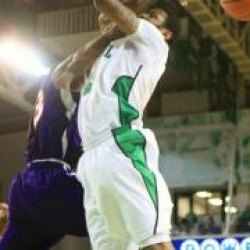 HUNTINGTON, WV (HNN) – DeAndre Kane’s jumper fell short as time expired as the Marshall Thundering Herd comeback fell just short, losing to the Ohio Bobcats 70-68 in front of 7,061 fans at the Cam Henderson Center. With the loss, Marshall falls to 5-1 while Ohio improves to 4-1. Ohio led by as many as 13 points in the first half and went into the locker room at halftime with a 36-27 lead. The Bobcat lead was 12 points at 67-55 with 5:31 left in the game. The Herd outscored the Bobcats 13-3 over the next 5:16 but Kane’s jumper fell short as time expired. Dennis Tinnon collected his third double-double of the season scoring 12 points and pulling down 14 rebounds. Kane led the Herd in scoring with 17 points. Joining Tinnon and Kane with double figures was Robert Goff who scored 11 and Damier Pitts who scored 10 points. For the game Marshall hit on 21-of-52 shots for 40.4% while Ohio hit on 29-of-58 shots for 50%. The Herd connected on 21-of-38 foul shots while the Bobcats connected on 7-of-11.